As the seasons change, so do your boat maintenance tasks. If you’re already a boat owner, it’s likely you’ve figured out that keeping your pride and joy in tip-top operating condition requires occasional maintenance—both mechanically and aesthetically. The end goal with maintenance is to have a boat that not only looks good, but also has systems that run reliably and at peak performance. Maintenance also prolongs the life of your boat and its systems and helps to prevent expensive repairs down the road. Still, lots of boat owners run into some confusion when it comes to figuring out when these tasks should be performed. Add in geographic areas where there’s little change in temperature and weather each season, and it causes even more befuddlement. With that in mind, we’ve prepared a basic guide to boat maintenance that rolls with the seasons, keeping you on top of the tasks that keep your boat beautiful and running at its best. For most boaters, autumn is a time when boating activity starts to wind down and folks begin to prepare their boats for the long cold winter, especially if they live in areas where freezing temperatures approach. Obviously, the main goal of winterization is to prevent freeze damage in engines and their components, as well as in water and waste systems. It’s also an important time to guard your boat from the icy elements, which can ruin the glossy shine on your hull, damage brightwork, and more. That being said, here are some essentials to take note of, when things start to turn cold and it’s time to put your boat to bed. Arrange to have boat hauled, or put it on a trailer if you plan on storing it out of the water. Make special preparations (see below) if your boat is to be kept in the water over the winter. Winterize all mechanical systems such as plumbing, sanitation, and engine(s). Clean, remove, and stow canvas and Eisenglass panels at home. Remove tackle and gear from boat if it’s better suited for indoor storage. Clean the decks and topsides, and cover your boat or have a pro shrink-wrap it. Consider removing batteries from the boat—if feasible—and storing them at home on a trickle charger to keep them topped off all winter. Check electrolyte levels if you have lead-acid batteries. Change engine oil and filters, lower unit oil, and primary fuel filters as needed. Fill fuel tanks at least 90-percent full and stabilize with an appropriate fuel additive. 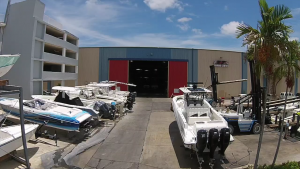 Perform an end-of-season trailer check, if you’re a trailer boater. This story was originally posted on Boats.com.